Removing digital rights management (DRM) protection from DRM protected content like movies, TV shows, and music videos etc. can be a super fun task for you if you have a right DRM removal tool and you know very well how to use that tool in order to remove DRM from iTunes movies or convert m4v to mp4 format. Gone are the days when people used to try any random free DRM removal software to remove DRM protection and convert iTunes M4V rentals and purchases on their system. Nowadays, people are very cautious and selective when it comes to picking best DRM removal software (and they should be too) because they love maximum features at a place. If you are also one of those users who are looking for a stable and multifunctional iTunes DRM Removal tool to remove DRM from iTunes rentals and purchases on Mac then “TunesKit iTunes DRM Media Converter” is the perfect solution for you. Let’s know in details – what is TunesKit iTunes DRM Media Converter and what are its valuable features? Basically, TunesKit iTunes DRM Media Converter is one of the most reliable and fastest iTunes DRM removal tools on the Internet which is specifically designed to help iTunes users easily remove DRM protection and convert iTunes M4V rentals and purchases to DRM-free MP4 format without any quality loss. This DRM M4V Converter comes with an advanced DRM decryption core so it’s able to work at 20x faster and can also keep the original audio and video tracks, including AAC stereo audio and AC3 5.1 surround sound, subtitles, closed captions, and much more. Along with all these amazing features, this DRM M4V Converter is unquestionably very simple to use and always surprise you with a great fast result. Once the DRM protection is removed from the iTunes M4V videos, users can enjoy the DRM-free files on any media device without any interruptions. TunesKit iTunes DRM M4V Removal Software is a home edition and available for personal use only. The most important thing, TunesKit iTunes DRM M4V Removal Software is available for the both operating systems: Windows (Windows XP, Windows Vista, Windows 7, Windows 8, Windows 10 & the latest iTunes) and Mac (Mac OS X 10.11 EI Capitan, 10.10 Yosemite, 10.9, 10.8 & the latest iTunes). So, get what you want. Why TunesKit iTunes DRM M4V Converter is Different from Other DRM Removal Software? 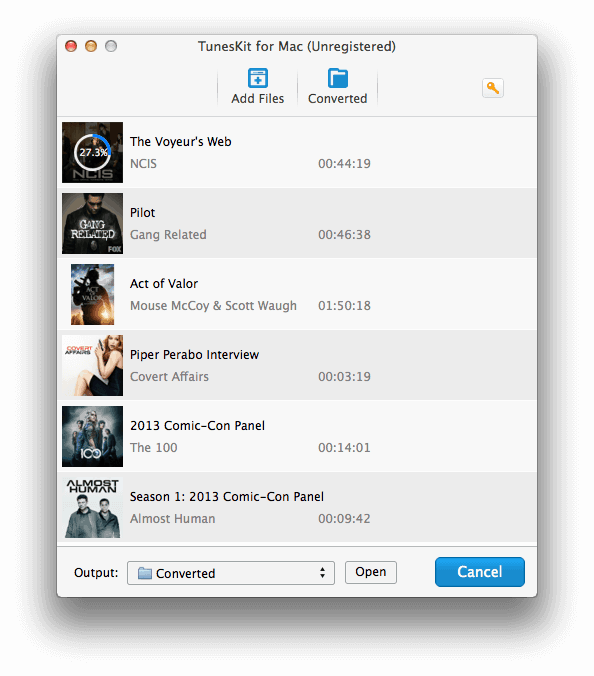 TunesKit iTunes DRM Media Converter for Mac is very well known for its fast conversion speed. So, if you really want to enjoy the 20X fast conversion speed along with the 100% original video quality then you should select this iTunes DRM removal tool. There are very few m4v to mp4 converter available on the web which offers the batch M4V files conversion features and TunesKit for Mac is one of them. With the help of batch conversion feature on TunesKit, it is possible to get hundreds of iTunes M4V movies converted in seconds. Generally, the majority of DRM removal software is available for a particular operating system or few specific versions. But the TunesKit DRM M4V Converter is available for the both operating systems (Windows and Mac) and all latest versions. Free upgrade and prompt support are other interesting things in TunesKit iTunes DRM M4V Converter, you are privileged to have free lifelong software upgrade and prompt technical support after a successful order is issued. According to the TunesKit Studio team, in the TunesKit M4V Converter for Windows and TunesKit M4V Converter for Mac they are going to add several useful features very soon and some of them are: more output video and audio formats, more preset output mobile devices, and other improvements to the UI. If you are looking for the maximum discount over TunesKit DRM Media tools then you should get TunesKit DRM Media Converter Bundle which is available with 50% OFF. In our personal opinion, TunesKit iTunes DRM M4V Media Converter is an all-in-one iTunes DRM Media Converter software to help you remove DRM from iTunes M4V rentals and purchases on Mac or Windows. So, if you were looking for a stable iTunes DRM removal tool to remove DRM legally and convert m4v to mp4 then start using TunesKit M4V Converter for Windows or TunesKit M4V Converter for Mac from now. This helps a lot for people who want to try converting their drm m4v video. Tuneskit is a good option. The program is also included in the ultimate list of best drm removal applications on DRM Wizard site.